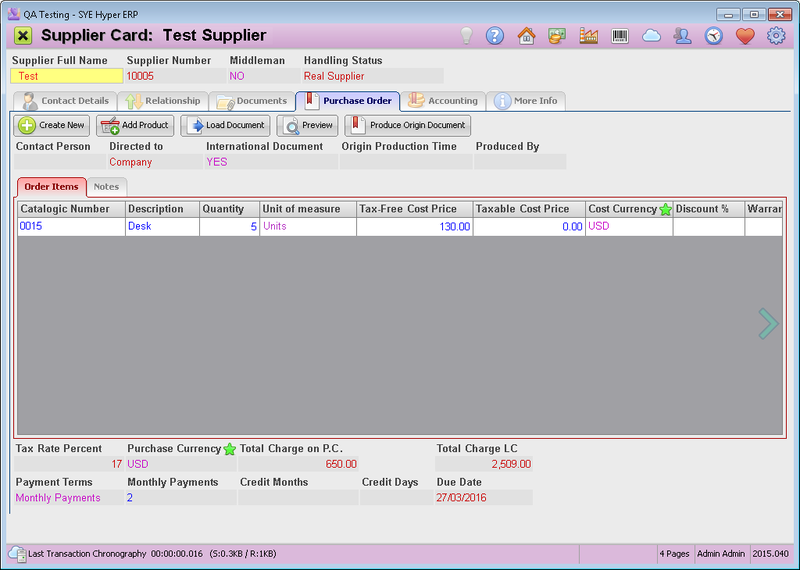 This tab of the Supplier Card, displays the purchase orders of this supplier and allows to create new purchase orders and produce an origin document. This is an official document and therefore has a unique serial number provided by the system. This tab is not available for middleman. Please Note - This tab is not available for any supplier that was defined as middleman. The order items table contains the order items and includes the items information fields, taken from the item card. These details can be modified by the user for the this Purchase Order only. Click the Create New button. This button will reset the "Order Items" table. Click the Add Product button. From the list of this supplier products, choose the required product. Click this button again to choose additional products. Please Note - The table displays only the related products of this supplier. In the "Notes" tab, fill in notes and comments for the purchase order document. At the top of this tab, fill in the addressee of the formal document. The fields at the top of the table are used to define the addressee of the invoice. The "contact Person" field is used to choose a person that will be mentioned in the "Intended for" title of the Invoice document, while the "Apply To" title will be referred to the company. If the Tax Invoice should be referred to the contact person, choose "Contact Person" in "Direct to" field. At the bottom of this tab, fill in the payment terms. Use the Preview button to verify the details of the Purchase Order. Click the Produce Origin Document to produce the approved document. By using this option, the user can produce a certified copy of produced Purchase Order. The system will add the title "Certified Copy" at the top of the document.